Entrepreneurs in our coworking space often don’t work traditional hours or days. The typical 9-5 job doesn’t apply to many business owners and startups. These professionals often work from home or rent out an expensive office space to get their work done. Our coworking space offers professionals a comfortable and professional setting for whenever they need a place to work or meet with clients. My Other Office In Burbank is a beautiful coworking, virtual office, executive suites, and meeting space serving Burbank, Glendale, North Hollywood, Toluca Lake, and Studio City. Call us at (818) 860-7500 for rates and availability. Many new business ventures balance personal and professional lives. Many entrepreneurs nowadays intertwine their personal and business lives. From working at home or telecommuting, entrepreneurs tend to mix their work and personal lives together which can result in distractions. By getting a coworking space, businesspeople can separate these two areas of their life and have a place to go whenever they need to get away and focus on their work. A varied work schedule means time management is imperative. People who don’t work a scheduled shift can often lose track of time. From meeting clients to focusing on more personal aspects, entrepreneurs need to really focus their time and energy efficiently in order to get their work done and stay on track. My Other Office provides individuals a productive and accessible environment where they can manage their time wisely. My Other Office is ready for professionals to come in and get right to work. We provide our members with all the services and amenities they need to stay productive. 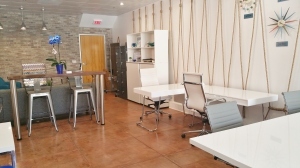 From coffee to help keep you focused, to secure WiFi for fast networking connections, we provide our members with everything they need to experience the comfort and convenience of our coworking spaces. We provide a work, event and meeting place for any situation. Whether you’re looking to host an open house, a mixer, or a gallery night, we can help provide you and your guests a spacious and comfortable environment. Our conference room and meeting spaces can also accommodate up to 20 people for presentations or board meetings.